A few months ago, my son’s friend gave us their piano when they decided not to take it with them when they moved out of state. How lucky are we?! We promptly found a piano tuner, set up lessons, and began listening to three kids practice and play. While it was an amazingly awesome gift, it wasn’t very “pretty”. It was a little beat up, and seemed to call out to me, “make me pretty!” I’ve been looking at it for months thinking that I should do something to it, but unwilling to pull the trigger on making the change. I woke up yesterday with the desire to “get something done”. Ever wake up thinking like that? Like, no matter what, something was going to get done? I have mental lists a mile long, and floating on top was the piano. I sat and stared at it for a little while. I looked at Pinterest for ideas (go check out my Piano board!). I thought about whether I should just add a pretty cushion to the bench and call it a day, because I was worried that I’d mess it up by painting it. Would it make it sound different if I painted it? What if… what if… Argh! I decided to just do it! I was going to paint it, and that was that. I knew I had lots of paint to choose from, but was stuck on which color to go with. 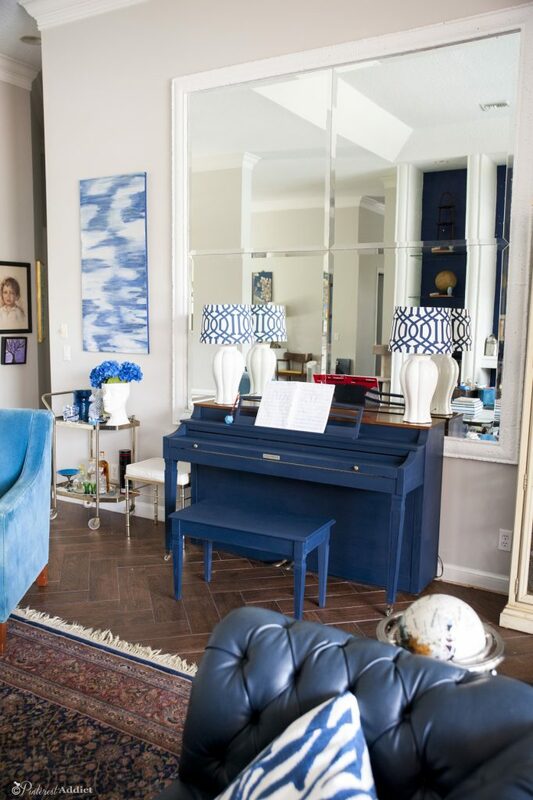 While I love a shiny black piano, I was afraid it wouldn’t go in my “blue” room. And white would be too white in the space. So, what about blue? I didn’t want to make it a bright blue, making it feel cartoonish in this more understate space. So, navy it would be. 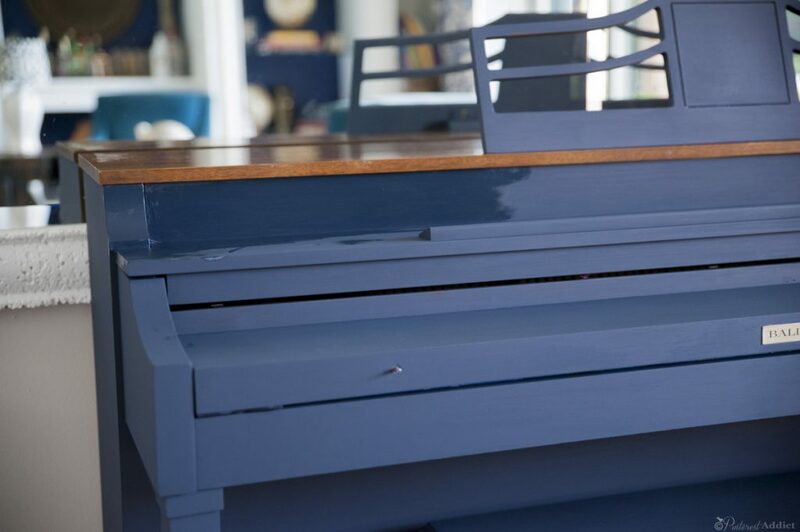 I didn’t have a dark enough navy, so I created what I was looking for by combining Folk Art Home Decor chalk paint in Nautical and Black until I got the right shade of navy. I wanted something about the shade of our Chesterfield sofa – deep, dark and moody. 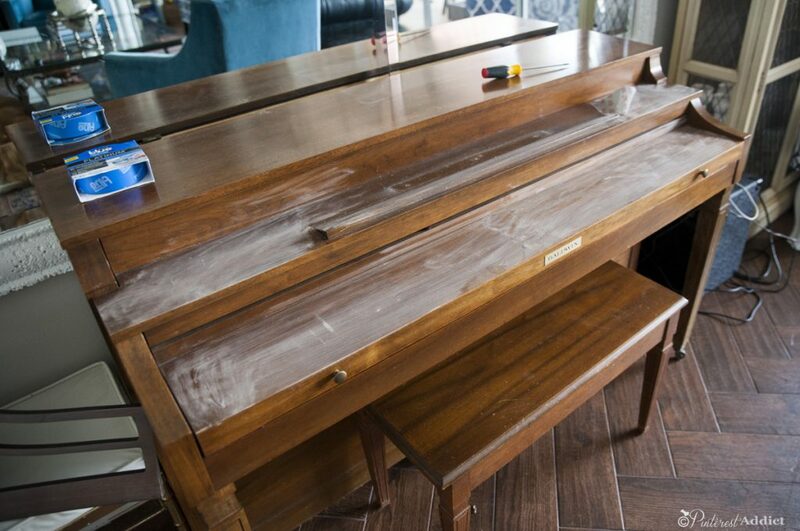 First thing I did was take a piece of 220 sandpaper and give the whole piano and bench a light sanding. Then, I wiped off the residue with a few damp paper towels and let it dry. I taped off the keys and the sections I didn’t want to paint, like the top, with some Scotch Blue Platinum painter’s tape. And I began to paint, holding my breath while the first section dried. I was afraid that it would be too dark and look like a dark gray, instead of a navy. I didn’t need to worry though, it was perfect. In all, it took me about two hours to paint the piano and the bench. Then, I used some beeswax chalky paint wax I had in my stash to wax it. The wax, although the biggest pain in the arse when using chalky paint and usually one of the reasons I avoid using chalky paint like the plague, makes the color deeper and darker. I used a wax brush to apply it, then wiped off the excess and let it dry. I haven’t quite figured out exactly what kind of cloth I am supposed to use when wiping off the excess, as I get TONS of little fibers everywhere. It’s a royal pain in the booty. Then, I let it dry, and buffed it to a slight sheen. While I hate the extra step of waxing when using chalk paint, it is honestly one of the smoothest finishes you can get when painting by hand. And while I understand it will take a while for it to cure completely, when it does, it will be a pretty durable surface. I have to say, I love it! 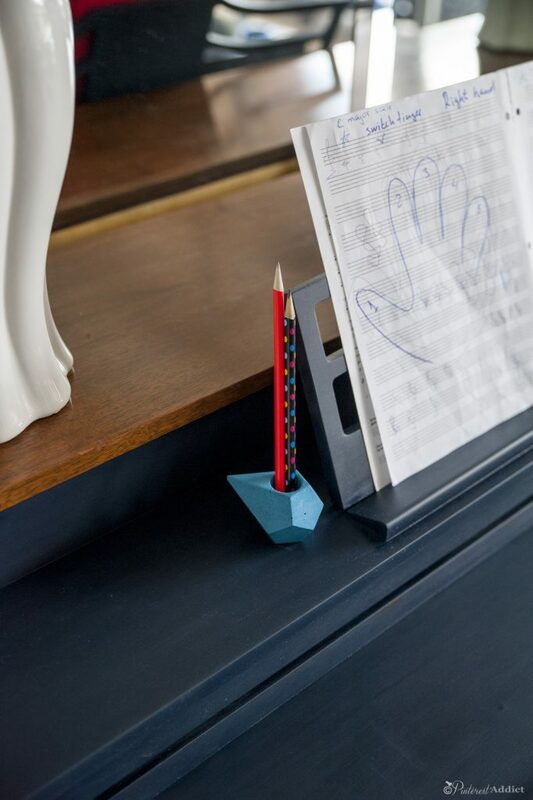 Last night, the piano looked like it was dark gray or even black, but today in daylight, it’s a perfect moody navy. It made the piano stand out without taking over the room. What about you? 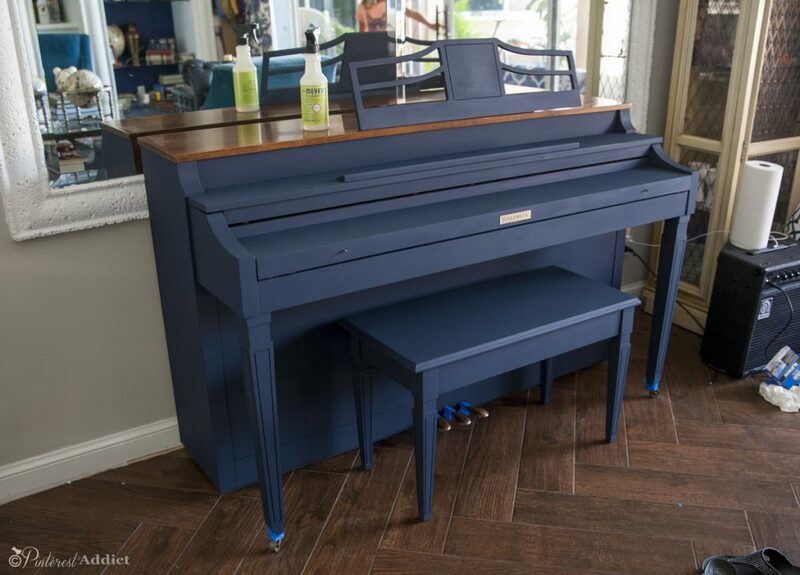 Would you paint a piano? Or do you, like my son, prefer the wood look? You did a beautiful job here. I love the color you chose as well. 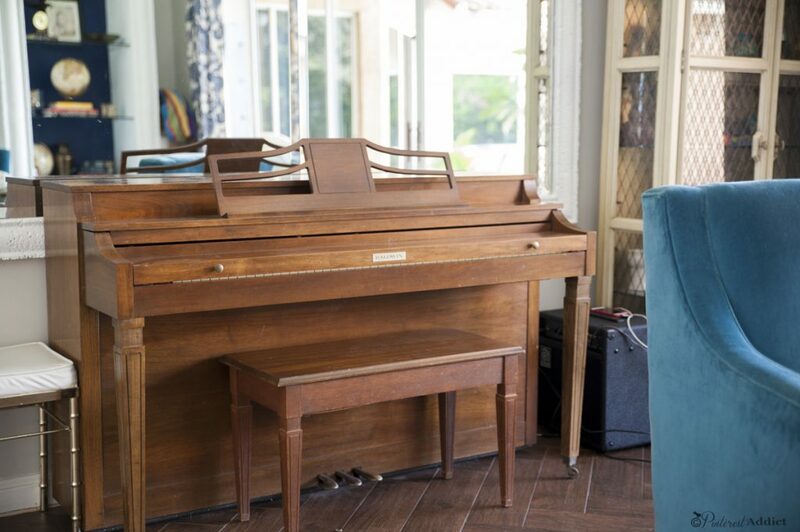 We have a piano exactly like this. 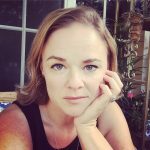 Our son took lessons for six years, but no longer wants to play. If we keep it, I will seriously think about painting it this gorgeous color. Thank you! If you do paint it, send me pictures!! Although I hate spending money on supplies when recycling might do, I decided it’s worth it to buy automotive waxing pads for removing/buffing the wax off my chalk paint projects. Guys who are taking care of car finishes need pads that will not scratch or shed, and they don’t want to pay lots of $$. You can wash them too and use again/for other purposes, depending on how heavily you used them. Excellent idea! I’m actually running errands today, so I’ll pick some up today. Thanks! Fantastic job! I would like to create the same look. How much paint did you use? Just one bottle of each? And roughly how much of the black paint did you mix in with the navy? Hello! Thank you so much for this post. 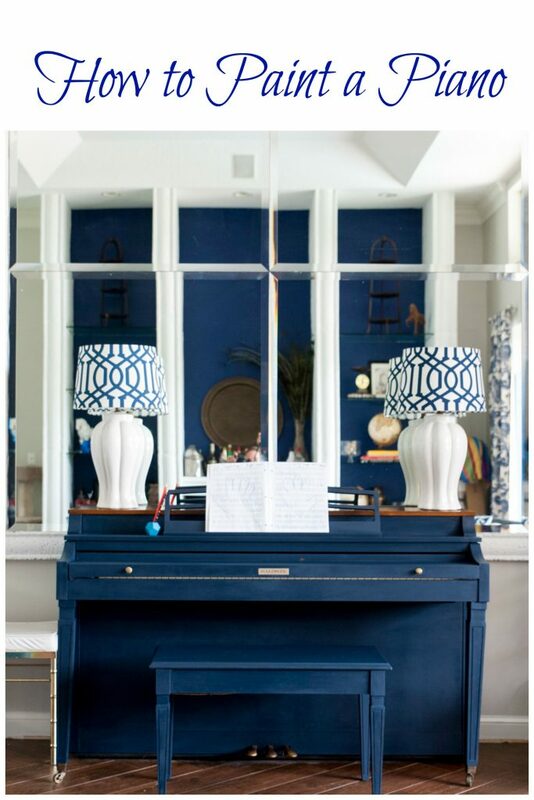 I am going to paint my piano this color! It will be my first time painting with chalk paint…I am a bit confused by the wax. Did you use clear or dark wax for this project? 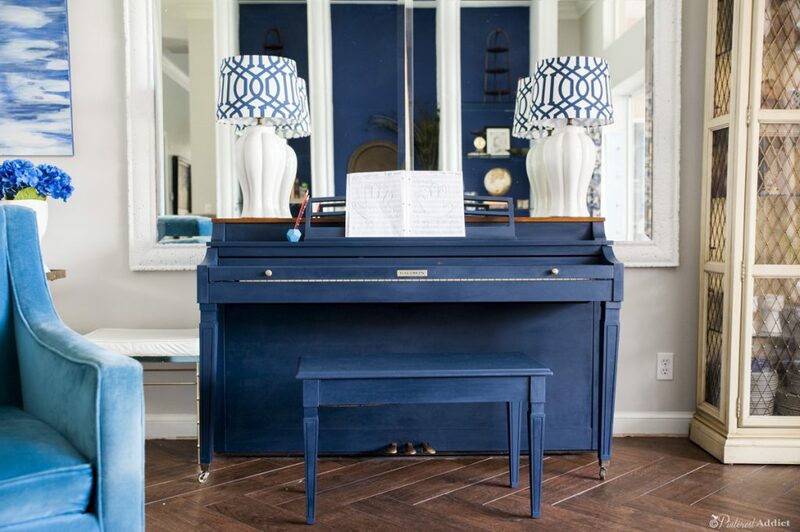 I really want a dark navy (I’m worried the piano will look like a cartoonish blue iF it isn’t dark enough) so that makes me want the dark wax, but i love the look of your piano, so if you used clear i would do that, too. Thanks so Much!